Image created with flatbed scanner. 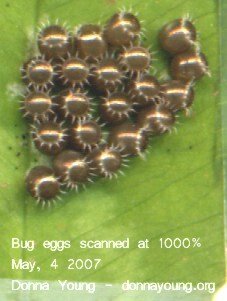 Early May, 2007, I found a clover leaf that had a cluster of bug eggs stuck to it. I brought the leaf inside and fixed it in my usual manner to specially folded 3x5 index card. Then I went about my usual routine. A couple of days later the bugs began emerging from the eggs. At that point, I scanned the event every 45 seconds or more at 1000%. I edited the resulting series of images and complied them into two movies. You may watch the movies from this web page. They are not remarkable movies, they merely show bugs coming up out of their eggs, and then in the second movie, the bugs change to their red and black color. The first movie shows the bugs hatching. The second movie shows the bugs changing to the first instar stage. Most of the bugs have already changed, but a couple of the bugs have not and those are the ones to watch.